Several months ago, I published a post with a module for firearms I was going to include in the Exploration Age Campaign Guide. 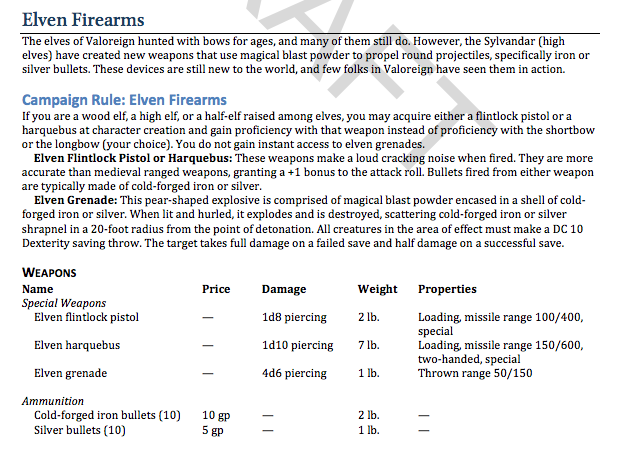 Some kind folks in the Wizards D&D forums pointed out to me that Chris Perkins has also released his own rules for firearms in his new Valoreign homebrew setting. 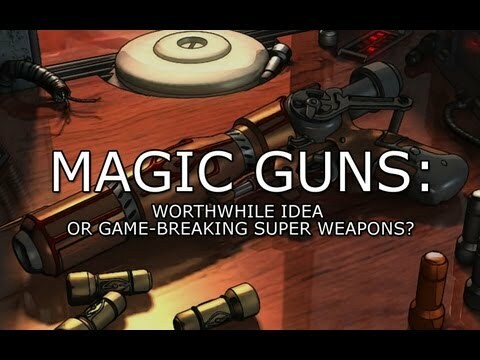 Similarly, Mike Mearls and the rest of the Wizards D&D R&D team have mentioned several times that an optional rules module for firearms will be in the Player’s Handbook or Dungeon Master’s Guide. These may be very close to the rules I proposed months ago, especially when I look at what Chris Perkins has already created and consider he is part of the aforementioned R&D team. So they got to it before me, and I’m going to go out on a limb here and say that their design is probably better realized and tested than my own. I’ll wait to see it completely before I pass judgement though, because I may still like my own way better for reasons listed in the initial post. Whatever the case may be, at the very least I will be keeping the rules for magical aberrant firearms in the Exploration Age Campaign Guide, if not the rules for gunpowder weapons, since it seems that their rules module deal only with the latter. Based on what Wizards of the Coast throws out there and the size of their weapons cache, I may even add a powder weapon or two of my own. When I posted On Firearms, I got a great comment from a reader that gunpowder changes things in a world. It means cannons, grenades, and more are available for armies, mercenaries, bandits, and evil-doers. The comment was meant as a caveat, but for me it was a good thing. There was always a plan to put these weapons in Exploration Age. I know a lot of you are probably groaning and saying, “I was ok with firearms sorta, kinda, but now you’ve gone too far, Introcaso.” Well, just remember that firearms and explosives are all optional. The Exploration Age Campaign Guide can be used as a bible for your world, but I welcome and encourage stealing, scavenging, harvesting, and modifying any and all ideas you please from the text. That’s what tabletop RPGs are all about! So get those imaginations flowing. If you do anything like that, drop me a line and let me know how it works out! As you can see above, Mr. Perkins has already supplied us with a grenade in his setting. This beast does a whopping 4d6 piercing damage (half damage on a successful DC 10 Dexterity saving throw) in a 20-foot radius. I like this model, since the grenade doesn’t outdo the fireball spell in terms of damage. 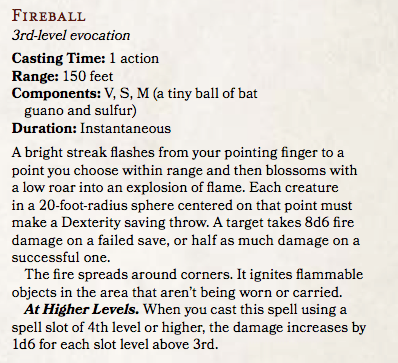 I’d never want the classic fireball to feel like it has been replaced by a (even possibly uncommon) item, because the magic-using classes would feel less powerful (and the PCs would be too powerful with easy access to weapons like that). In Valoreign, the grenade has no price, meaning it must be found or specially made. In Exploration Age, I’m thinking grenades may operate a little differently, with grenades for sale, but at a high price, so adventurers can’t stock up on them easily, but powerful governments and mercenary groups, like the Explorers’ Guild and The Society of Seekers, could. Also, I wanted the save DC to be related to the skill of the attacker and not just have a static number. Also, why have one kind of grenade when you could have a whole bunch of bombs? Check out this excerpt from the Campaign Guide. Grenades and bombs are martial weapons, with a special exploding feature. Use the chart and descriptions below when attacking with these weapons. Since all grenades and bombs have fuses which must be lit before being thrown, you may only attack with one grenade per turn. Grenades have a range of 50 feet. Fire Bomb. When a fire bomb explodes, any unattended flammable objects in the radius of explosion ignite. Frost Bomb. Creatures who fail their Dexterity save against cold damage in the radius of the frost bomb’s explosion have their speed reduced by 10 feet for 1 minute. Thunder Bomb. Creatures who fail their Dexterity save against thunder damage in the radius of the thunder bomb’s explosion are deafened for 1 minute. Exploding. A weapon with this property doesn’t require an attack roll. Instead you throw the weapon within its range and the weapon explodes within its given radius. Creatures within the radius of the explosion must make a Dexterity saving throw DC 8 + your Dexterity modifier + proficiency bonus if applicable. Creatures take full damage on a failed saving throw, half on a successful one. Grenades can be a hazard to the user – especially in the hands of a novice. Each time you throw a grenade, roll a d20. On a roll of 1 the grenade explodes in your hands. If you are not proficient with grenades, then it explodes in your hands on a roll of 1 or 2. Pretty fun, eh? Picture a halflings rogue running in circles around and chucking bombs at a big dragon or an elf lobbing fire bombs into a zombie throng. That’s the stuff legendary sessions are made of! Hope this makes you think imaginary explosives are fun. You can even see that if gunpowder isn’t your scene, Exploration Age has some more alchemically charged bombs for your enjoyment. So I wanted to share with you some ideas I had for siege weapons in the wonderful world of Canus. Take a look at the excerpt below. 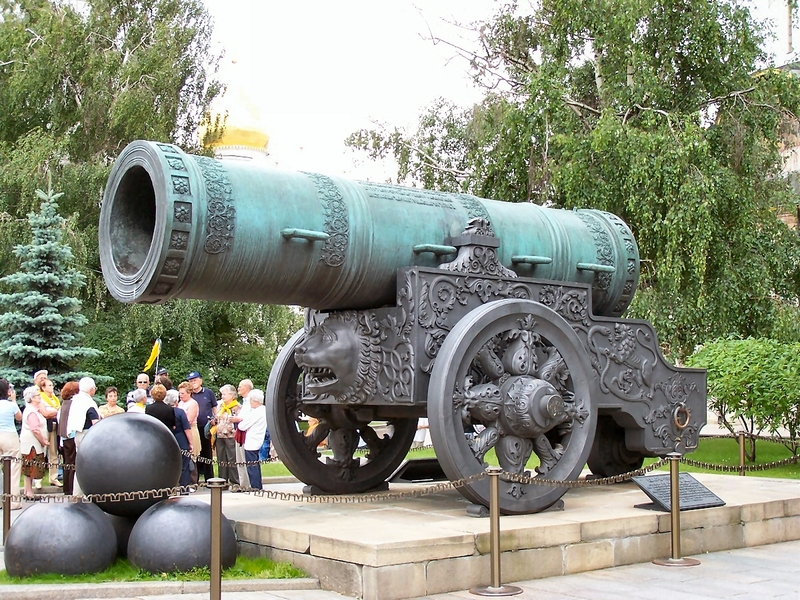 Here is a ridiculous cannon. Siege weapons are an enormous part of Canus’ war-torn history. Take a look at some of the types of siege weapons PCs may come across in their travels. The chart below indicates their size, damage, range, required number of crew to operate, and rounds between reloads. While price is also indicated on the chart, siege weapons are not easy to buy. In general an independent buyer needs to purchase them on the black market, where prices could be marked up as high as five times the indicated value. Adventurers with international reputations on the side of a specific recognized government or global cause may be able to purchase such weapons for market value, and large, legitimate mercenary operations and federal armies may also purchase siege weapons for their indicated price. Unless otherwise indicated, siege weapons have a hard time with smaller, moving targets. Any time a siege weapon is used to target a single creature of Large size or smaller, the attack roll has disadvantage. Each siege weapon’s crew has a designated leader who decides when to fire and aim the weapon. Each member of the crew must use his or her action to attack with the weapon. The attack bonus of a siege weapon is calculated by using the leader’s Intelligence modifier and adding it to the leader’s proficiency bonus (if applicable). The leader’s Intelligence modifier is also added to the damage of the siege weapon. Once a siege weapon is fired, it’s crew must remain adjacent to the weapon and use their actions for the number of reload rounds indicated before the weapon may be fired again. Siege weapons which require a crew of two may be operated by one person, but reloading takes three times as long. Cannon. These muzzle-loading cannons can be mounted on a ship, castle, or wheeled around slowly, by person or by mount and fire various kinds of shot (see below). They are powered by gunpowder. Catapult. This onager model catapult is winched down, loaded, then released. It travels on four wheels and is usually pulled by horse or other pack animal. Sometimes diseased bodies of humanoids or animals are loaded into the catapult and fired over the walls of enemy forces with hopes of infecting their soldiers. A target must be at least 30 feet away in order for a catapult to attack it. Trebuchet. This trebuchet catapult is larger than a onager model and has a much longer range. It uses a counter-weight system to hurl its ammunition great distances. These wheeled behemoths require teams of humanoids or pack animals to be moved. A target must be at least 50 feet away in order for a trebuchet to attack it. Ballista. Basically a ballista is a giant crossbow, which can be mounted on the wall of castle or deck of a ship. These siege weapons can also be wheeled around by pack animals and shoot large, iron-tipped arrows. Ballistas are more accurate and do not have the usual siege weapon disadvantage when attack single target creatures of Large size or smaller. Arcane Cannon. Special alchemical canisters developed from aberrant technology are loaded into these jeweled cannons, which hurl elemental and arcane energy at foes on the battlefield. The cannons are wheeled, like their mundane counterparts, and can be transported similarly. Round Shot. Round shot is a large metal ball, which is loaded into a cannon and fired at a single target. Round shot deals 6d6 bludgeoning damage to a target. Chain Shot. Two small balls linked together by a length of bladed chain, often fired at sails of enemy ships in order to cause maximum damage. Chain shot deals 2d6 slashing damage, and deal quadruple damage to cloth targets. Canister Shot. A large canister full of small bullets which immediately explodes when fired. Instead of a normal attack, the bullets spray an area within a 30-foot cone in front of the cannon. Any creatures within the cone must make a Dexterity saving throw (DC 8 + the siege weapon’s crew leader’s Intelligence modifier + proficiency). Creatures who fail the save take 4d6 piercing damage, creatures who succeed take half damage. Shell. Shells are explosive rounds which detonate on impact. Instead of a normal attack, the shell can be fired 1,000 feet and explode in a 20-foot radius. Any creatures within the blast must make a Dexterity saving throw (DC 8 + the siege weapon’s crew leader’s Intelligence modifier + proficiency). Creatures who fail the save take 4d6 piercing damage, creatures who succeed take half damage. Stone. These are literally big, heavy stones hurled from a catapult or trebuchet and deal 5d6 bludgeoning damage to a target. Fire Barrel. Flaming barrels of oil and pitch can be thrown from a catapult or trebuchet. Instead of a normal attack, choose an area within the weapon’s normal range. The barrel explodes in a 20-foot radius. Any creatures within the blast must make a Dexterity saving throw (DC 8 + the siege weapon’s crew leader’s Intelligence modifier + proficiency). Creatures who fail the save take 3d6 fire damage, creatures who succeed take half damage. Unattended flammable objects within the area ignite. Acid Shot. Acid shot is a green canister which explodes upon being fired and sprays all over enemy forces. Instead of a normal attack, the acid sprays an area within a 30-foot cone in front of the arcane cannon. Any creatures within the cone must make a Dexterity saving throw (DC 8 + the siege weapon’s crew leader’s Intelligence modifier + proficiency). Creatures who fail the save take 6d6 acid damage, creatures who succeed take half damage. Force Shot. A humming blue canister, force shot is the strongest type of siege weapon ammunition around. It deals 10d6 force damage to a target. Fire Shot. A warm, red canister which glows, fire shot explodes on impact. Instead of a normal attack, choose an area within the weapon’s normal range. The fire shot explodes in a 20-foot radius. Any creatures within the blast must make a Dexterity saving throw (DC 8 + the siege weapon’s crew leader’s Intelligence modifier + proficiency). Creatures who fail the save take 6d6 fire damage, creatures who succeed take half damage. Unattended flammable objects within the area ignite. Frost Shot. A cold, black canister, frost shot explodes on impact. Instead of a normal attack, choose an area within the weapon’s normal range. The frost shot explodes in a 30-foot radius. Any creatures within the blast must make a Dexterity saving throw (DC 8 + the siege weapon’s crew leader’s Intelligence modifier + proficiency). Creatures who fail the save take 4d6 cold damage and have their speed reduce by 10 feet for 1 minute, creatures who succeed take half damage and no penalty to speed. Lightning Shot. A white canister, lightning shot attacks in a single line which is 100 feet long and 5 feet wide. Each creature in the line must make a Dexterity saving throw (DC 8 + the siege weapon’s crew leader’s Intelligence modifier + proficiency). Creatures who fail the save take 8d6 lightning damage, creatures who succeed take half damage. You can see a few things going on in the excerpt above. First of all, siege weapons have several types of ammunition, which really determine how their attacks plays out. Siege weapons meant for brining down walls, ships, large groups, and big baddies – not attacking just a few humanoids. These are crazy mechanical machines, so their attack and damage bonus come from an operator’s Intelligence modifier – representing the crew leader’s knowledge of the mechanics of the weapon. For the most part, I imagine many PCs will not encounter siege weapons often. When they do, they’ll more likely be on the business end of a cannon or catapult. Still, I could see PCs investing in their own ship or castle and outfitting it with some siege weapons. The encounters that could come from a battle on the high seas or defending a fortress could be memorable indeed with some cannons in the mix! Or imagine the PCs turning the tide of battle by commandeering an enemy ballista for themselves. Siege weapons and PCs seem perfect for each other in the proposed Battlesystem rules, which we will see fully in future D&D products. In this Legends and Lore article, Mike Mearls tells us each turn in the mass combat rules are a minute, which means a PC could lead a crew in firing a siege weapon several times on his or her turn. Not to mention mass combat seems the most-likely place you’d find one of these siege weapons. Let me know what you think! What did I get right? What can I do better? You guys rock!